Many community members have been asking us about the annual Trinity Bellwoods Yard Sale for 2012. For those of you who aren’t familiar with it, for one Saturday in the summer, the park turns into a giant community yard sale. Here is a post detailing some of the “Hot Bargains” found in previous years. If you would like to be a vendor at the sale, you will need to preregister and pay a small fee and deposit. This year’s sale will be from 10 AM – 5PM on Saturday June 16th, 2012. Cash only. All funds collected will be placed back into children’s programs at the Centre. A brief history of Garrison Creek. BlogTO has a great article on the history of the Garrison creek, which used to run through the heart of Trinity Bellwoods park, and still does, albeit underground. …Garrison changed direction and headed south-east into Trinity Bellwoods Park where it carved out a broad, shallow ravine popular for sledding in the winter. 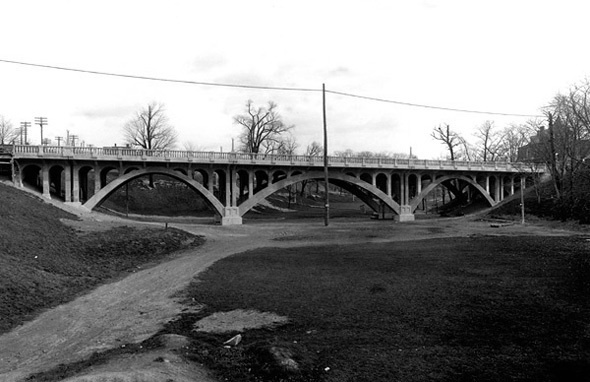 A bridge across the river at Crawford Street was built by R. C. Harris, the former Commissioner of Public Works who lent his name to the R. C. Harris Water Treatment Plant in the Beaches. Like the Harbord bridge, it too was buried where it stood when the ravine was filled in. Here is the proposed agenda for tonight’s TBCA meeting. As always, our meetings are held on the 2nd Floor of the Trinity Bellwoods Community Recreation Centre at 7 pm and are open to all members of our community, so please feel free to join us! 6. York West Developments – See email from Mima Vulovic on February 27, 2012. York West is not going to the OMB. 8. Logo & Ad – 7 responses. Option 1A gathered the most votes. Ad space in community centre still available. 9. Rio Can Development (Kromer Radio Site) – TTC suggested traffic study was incorrectly done. Did anyone attend the beautiful sunny Sunday afternoon meeting? Tania forwarded minutes. C of A on April 4, 2012.
subject line. Game of “six degrees” to boost the number of newsletter subscribers. 12. 109 Ossington – Mike Layton and Craig Hunter met, any update from Cllr Layton’s office? 13. Friends Meeting – FoTB Meeting happened March 1 with the Park People, was there an update? 14. Community Police Liason Committee – Cathy Byrd, CPLC Chair – was TBCA invited? PARA appears to be actively involved. 17. Hawker Bar – Liquor licence application for late night bar on Ossington across from residential development. 70 signatures on petition. Michael attended a meeting with Nicky and Mike Layton and reported back. Not all members of the TBCA executive agree on a position. 19. FRONT YARD PARKING PAD – c.c. Tom Barnett, Resident – Request to bring front yard parking pad up to code. Allowed? 20. Hoarding posters – c.c. Resident. A local resident is offended by advertisements on hoarding. Advertising Standards Canada Gender Portrayal Guidelines. Announcement from co-chair Chris Walker: Effective immediately Chris S is taking a three month leave of absence from his co-chair responsibilities. The TBCA executive wish him the best and thank him for all his efforts over the past two years. Chris Walker will now chair the group. – Michael asked about liquor licensing. Kiosk solar, focus on residential solar installations. Kiosk solar is an end to end solution that manages the installation and maintenance of the install : site evaluation, paperwork, capacity checks etc. Their systems are specifically designed for residential 10KW systems that feed back into the power grid. We have yet to see the specific patio conditions for the Woodlot and Campagnolo patios, we have seen the generic ones. Chris W offered to draft a letter of support for the three business. Woodlot was approved, without our letter. We don’t know what the conditions under which they were approved. We support in principle, but we will not issue letters without seeing the specific details. Chris W looked into the height for confirmation, and got three different answers, so we are not sure what the final height was. We agreed on 27.25 overall including Penthouse. Group is preparing to present to the community at large the improvments that the group would like to see. 114 & 116 Robison have applied for a third floor, which will have further community impact. Went to council on Feb 6 for resolution. To do that, incorporation is almost a necessity, which is a cost and effort that has not been contemplated by the group. no formal city street scape plan, but the BIA’s pick up the slack. It’s important to remember that as the area becomes more gentrified the trend is for the larger big box business to come in, and that we should not necessarily rail against this. went to committee on Feb22, which after expansion left zero green space, we don’t know what the outcome was. Michael Sims is going to try to influence the project. MPP Rosario Marchese, Scadding Court Community Centre and the Chartered Accountants of Toronto are hosting free income tax clinics on April 16thand 17th from 6-9pm. Appointments (deadline is Apr 2) must be made by calling 416-603-9664 or emailing lukacha@ndp.on.ca. SPACE IS LIMITED. This is a great opportunity for people to have their taxes done by Chartered Accountants for no cost!